If you've read enough of my blog posts, or followed me on Instagram for long enough, you know I am a firm believer in enjoying the "real deal" when it comes to sweets... but in moderation of course. 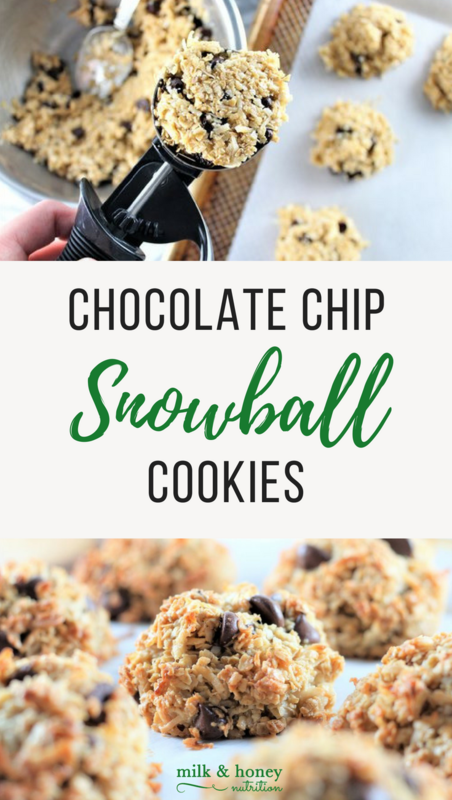 And these Chocolate Chip Snowball Cookies are just that. I don't buy pre-made cakes, cookies, pies, etc. from the store. When I want one of these things, I force myself to make it at home before I can eat it. I have to consider if I really want to take the 45 minutes to an hour it will take to prep them? But if the answer is yes, you better believe I'm going to enjoy them with zero guilt or regret! These cookies are perfect for times like that... There's nothing "diet" about them. Made with high quality, nutrient dense ingredients, like the new Sprouts Brand Ghee (clarified butter), unsweetened coconut, and whole grain oats, they are a tasty indulgence that any crowd will love! This post was sponsored by Sprouts Farmers Market. All thoughts and ideas are my own. Mix all ingredients, except chocolate chips, together using a spatula or spoon. Bake for 20-25 minutes until golden brown and the tops are crispy. Remove cookies from the oven and let them sit for 5 minutes. Transfer to a cooling rack. Enjoy warm, or store in an airtight container unrefrigerated for up to 3 days. Freeze any remaining cookies after 3 days.